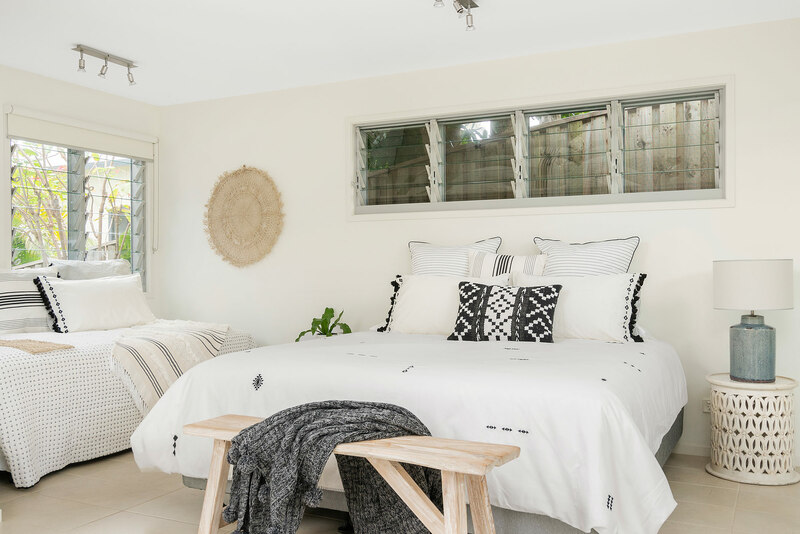 Beautifully renovated and restyled, follow The White Rabbit to a charming wonderland in the heart of Byron Bay. 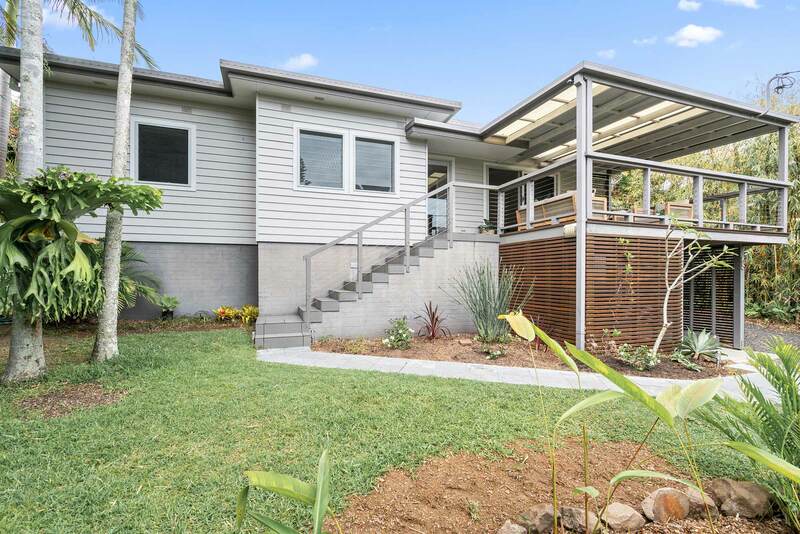 This stylish 3-bedroom cottage includes a separate studio, 2 bathrooms, and an open-plan living space with modern kitchen and dining area. 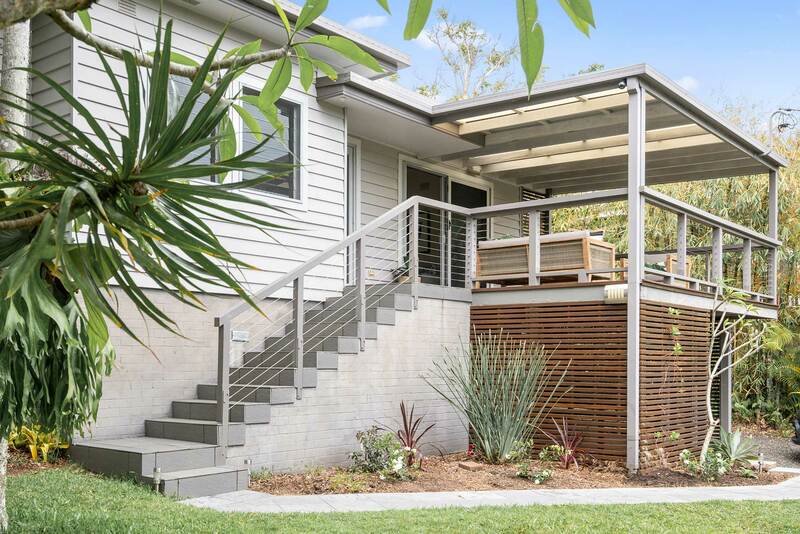 The covered outdoor decks are perfect for entertaining, with dining space and BBQ in the rear and relaxed seating at the front. 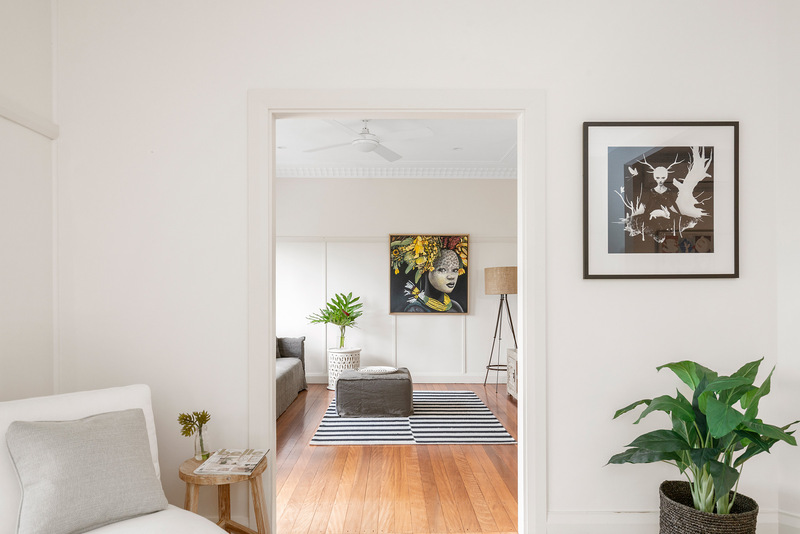 At The White Rabbit, you’re never more than a short walk or drive from Byron’s world-class restaurants, shopping, and incredible beaches, ideal for surf or sun. Enter The White Rabbit and feel right at home in this charming beach cottage. 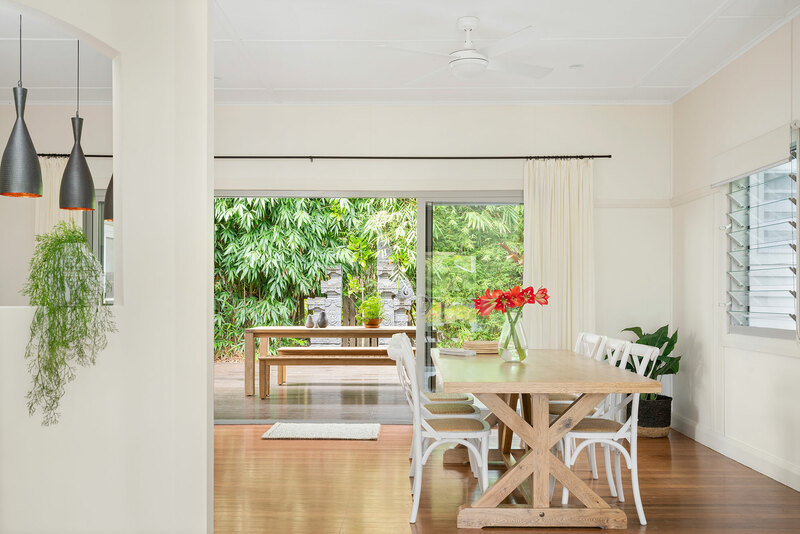 The entry sitting area is an inviting space that welcomes you home after a long day of exploring the best of Byron Bay. 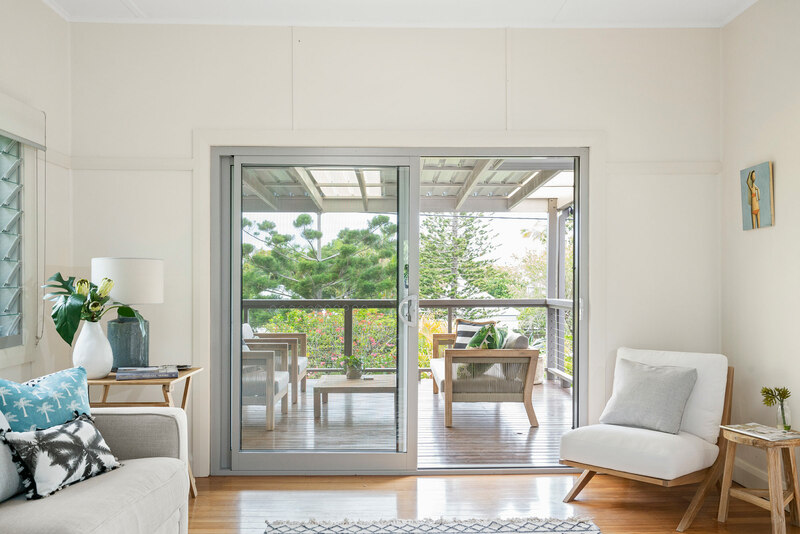 Leave the sliding glass doors open to let the fresh sea breezes in or keep them closed and cool off with air conditioning. You’ll want to settle into the plush sofa, kick off your shoes, and curl up with a good book. 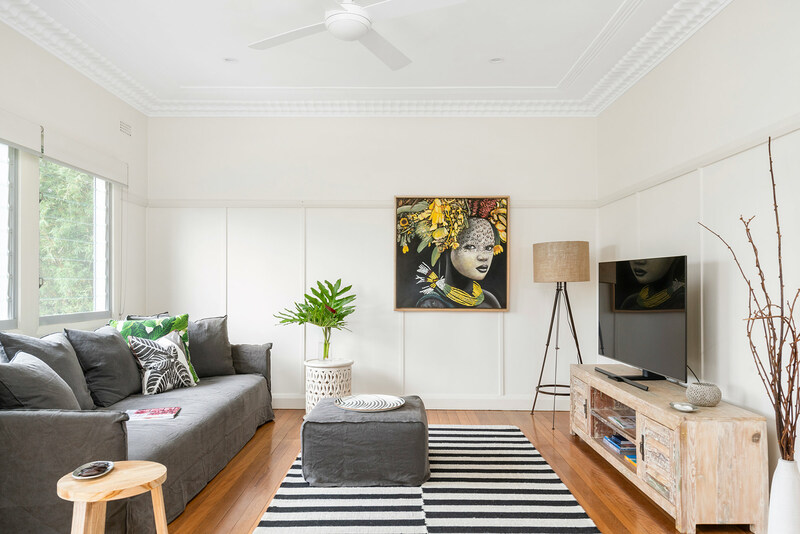 Just off the sitting area is a cosy, comfortable media lounge with a generous-sized Smart TV and complimentary WiFi, ready for your next Netflix movie marathon. 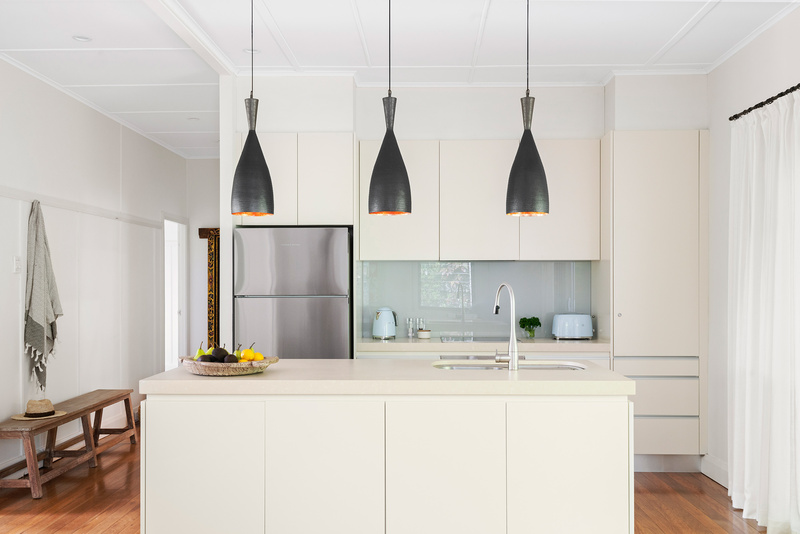 The sleek, modern kitchen is equipped with European appliances and opens onto the dining room. 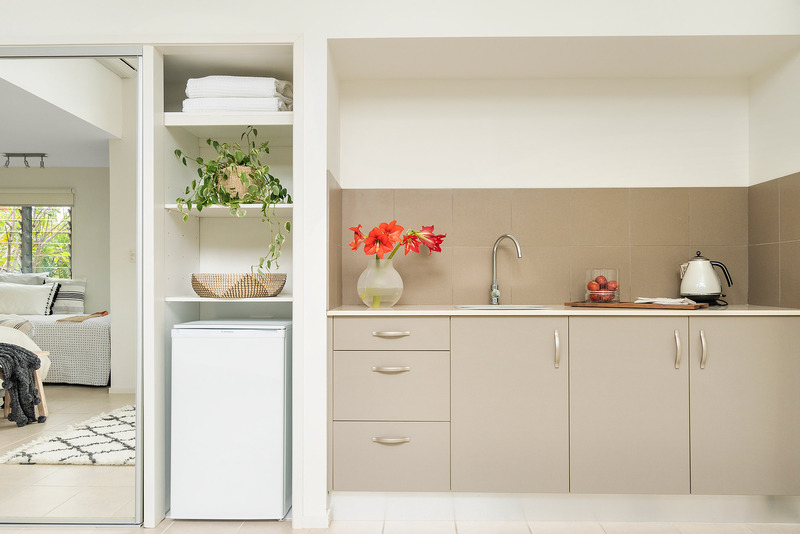 With built-in pantry cupboards and a spacious kitchen island, you’ll have everything you need to prepare and serve delicious meals. Enjoy family dinners together at the large dining table, or simply savour your morning coffee with the sliding glass doors open and sunshine pouring in. There is an additional kitchenette in the separate studio, great for whipping up a quick cup of coffee or keeping your favourite snacks close by. Hardwood floors, wainscoting and coffered ceilings give the 2 bedrooms in the main house a distinct cottage charm. 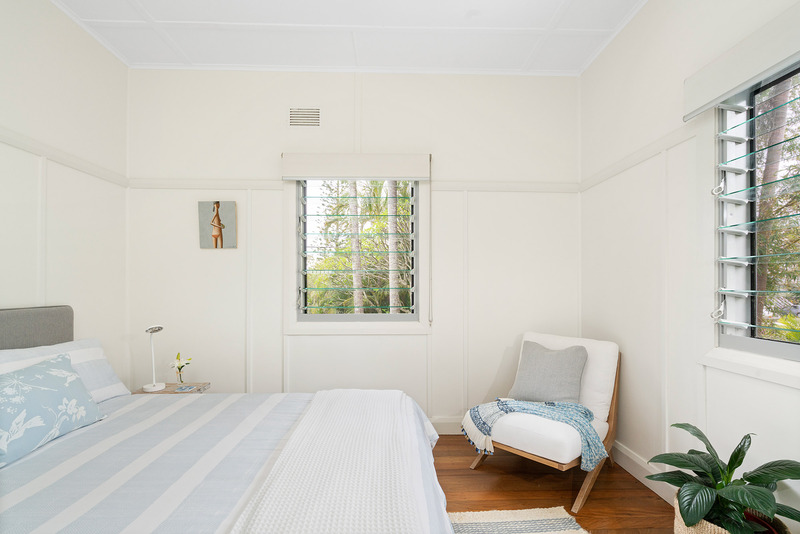 As with the rest of the home, these rooms have been lovingly restored with the Byron Bay beach lifestyle in mind. In one bedroom is a queen bed, while the other has 2 king-single beds which can be made into 1 king bed by request. Tucked away from the main house but connected by a covered deck is the separate studio. This peaceful, 3rd bedroom retreat is a bright, airy space with vaulted ceilings and a king bed which can easily be split into 2 singles by request. 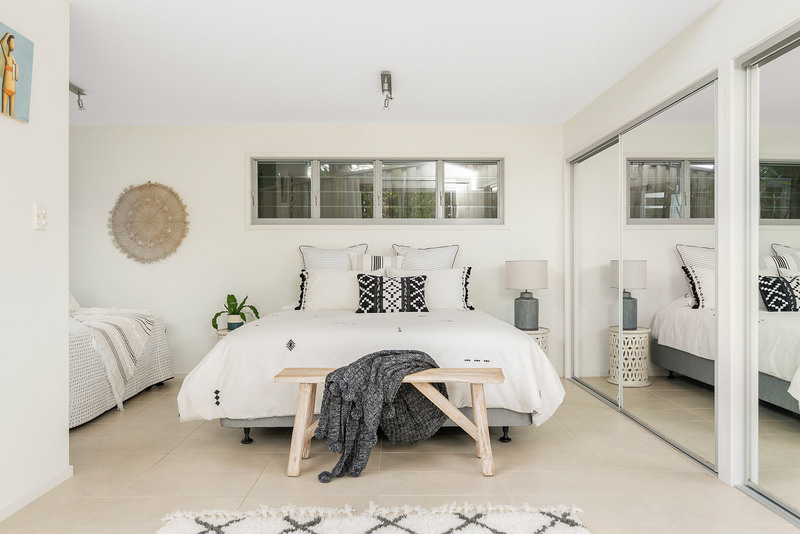 An additional single bed is a comfy spot to lounge during the day, with the option of a trundle available creating a perfect sleepover space for children or a quiet sanctuary for an adult couple. There is an additional trundle bed in the studio, suitable for 1 child and available by request. There are 2 bathrooms at The White Rabbit; one in the main house and near the separate studio accessible via the covered outdoor deck. 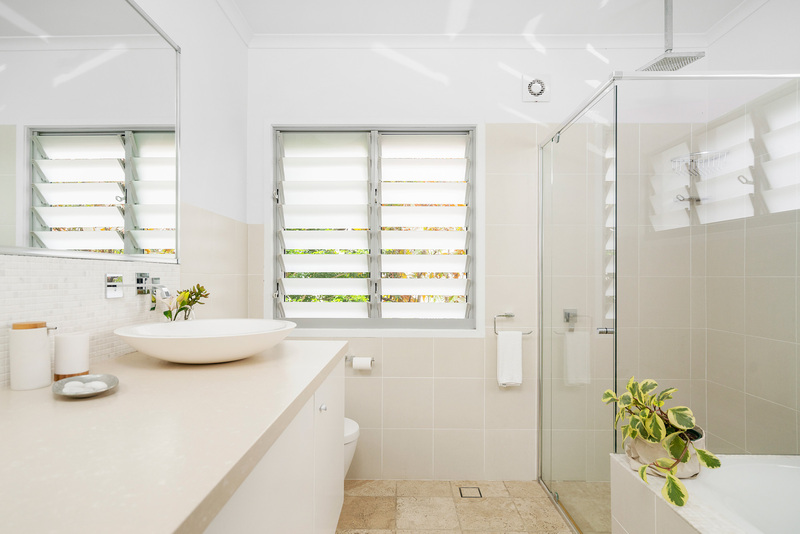 Similarly styled in a neutral colour palette, the studio’s bathroom includes a glass-enclosed rain shower and separate bathtub (this is for the studio), perfect for soothing surf-sore muscles with a warm soak. The main bathroom includes a shower and toilet. 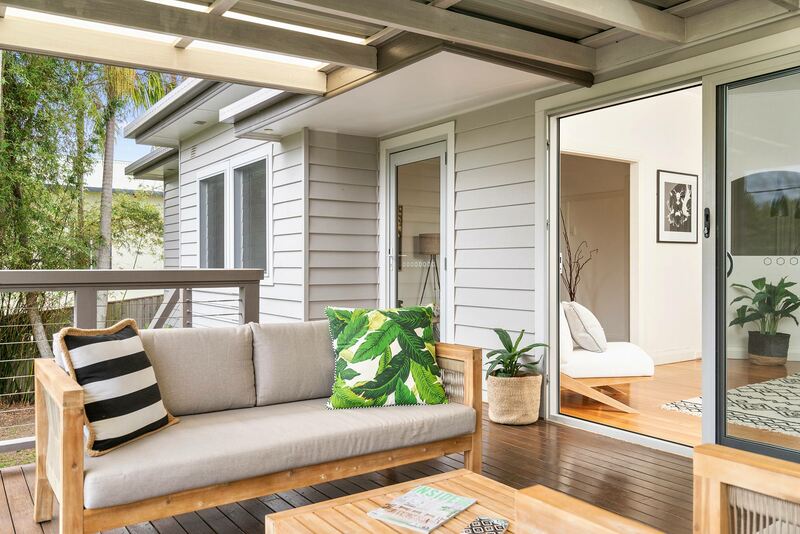 The indoor and outdoor spaces are seamlessly connected at The White Rabbit, creating a comfortable flow between the two covered decks and inside living areas. 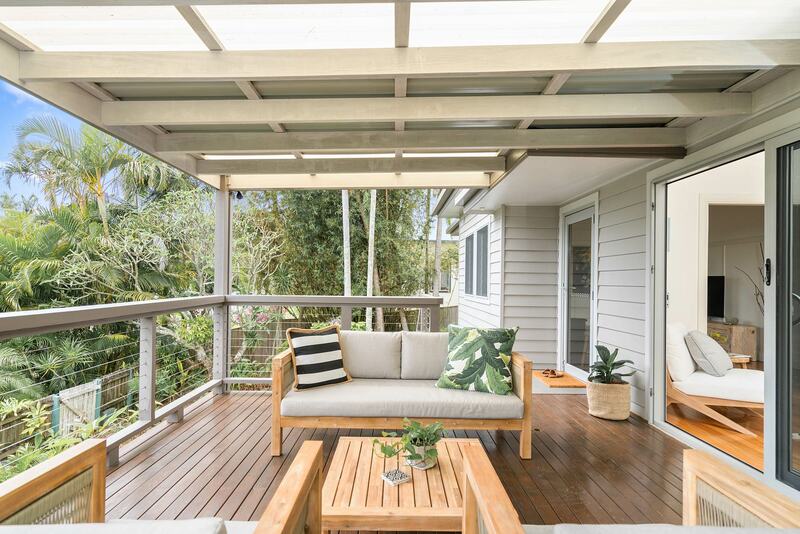 The front deck features an outdoor seating area which serves a welcoming entrance to the home, where gentle sea breezes can be felt over coffee and conversation. 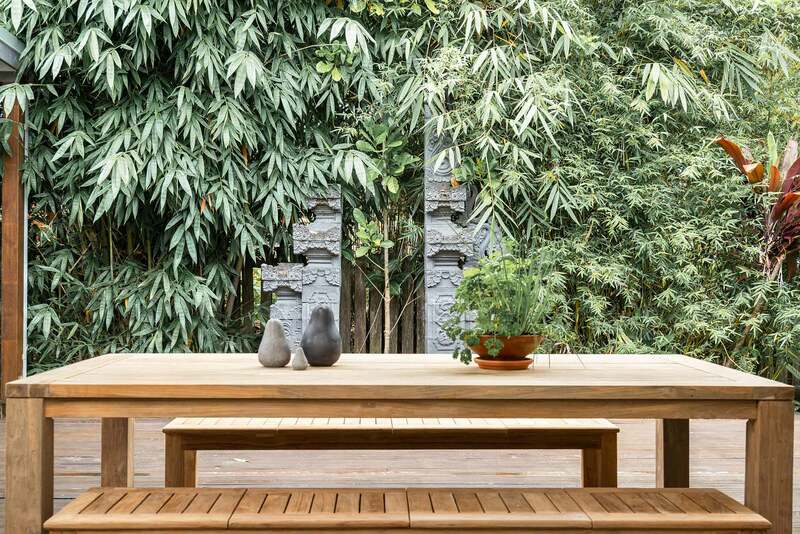 Just off the kitchen and dining room is an enchanting garden deck with an additional, spacious outdoor dining table and BBQ. There is parking for 1 car in the carport and space for 2 additional cars off-street. The garage is not available for guest parking. 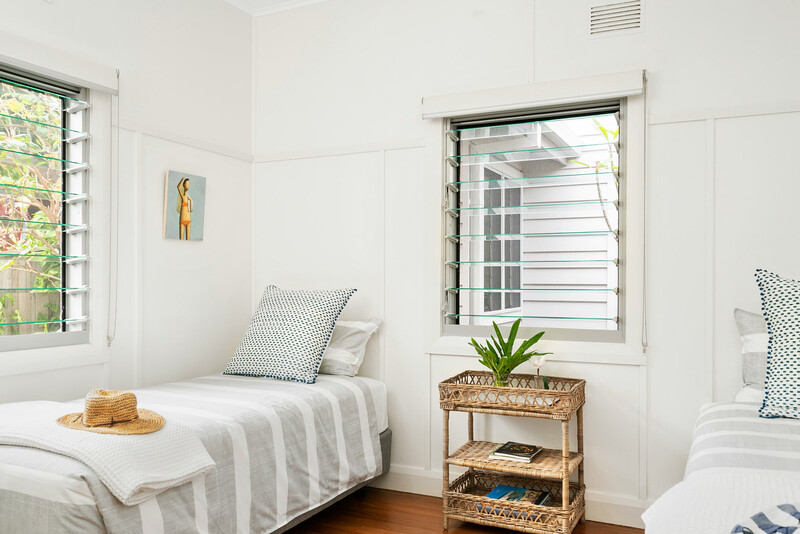 Stay in the heart of town and enjoy all that beautiful Byron Bay has to offer. 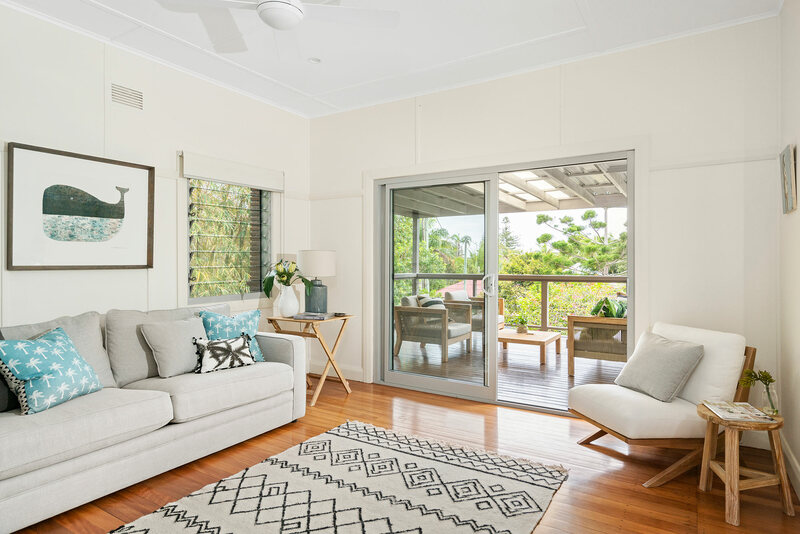 Sun, sand, and surf are never more than a short walk or drive away, or opt for a leisurely stroll to reach nearby Clarkes and Tallow Beaches in 10-15 minutes. Visit the popular Top Shop Cafe for your morning brew and swap surf stories with the locals over a hearty brekkie. Indulge in a bit of boho boutique shopping at Spell; the beloved Byron Bay flagship shop is just around the corner. There is much more to love about Byron, from dreamy spas and yoga studios to world-class restaurants and shopping, all within easy reach. 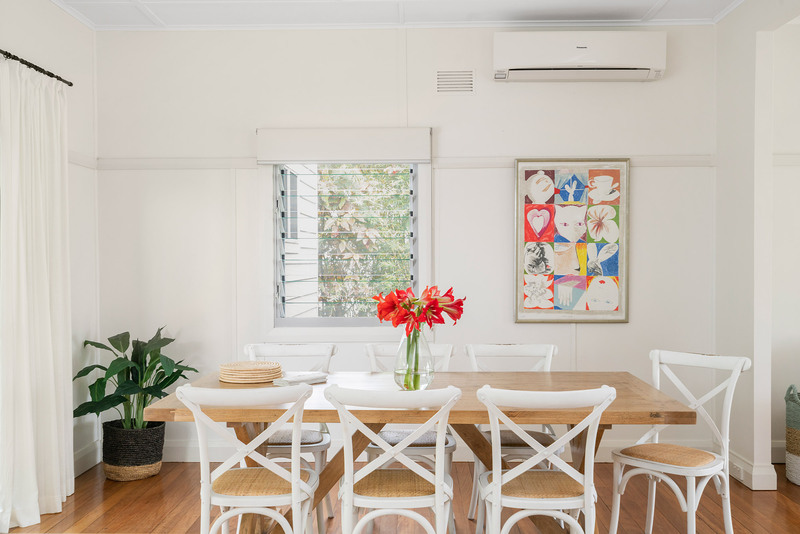 Group restrictions – maximum 6 adults at the property unless otherwise approved directly with A Perfect Stay/Byron Bay Holiday Rentals. We really enjoyed the house and dealing with A Perfect Stay was always really great. Everyone was so helpful and friendly. I was super impressed. Thanks so much! Thank-you for a wonderful stay at “The White Rabbit”. It was a luxurious, immaculately clean, tranquil home which was beautifully appointed throughout..... The bedlinen, the electrical appliances, the furniture, kitchenware and even the bathroom products were just lovely. The photos shown on this website are a true reflection of this exquisite home. We had a peaceful and relaxing weekend and would love to come again. We have shared your home with our friends on Facebook - it would be lovely for others to experience your beautiful home for themselves! Thank you for accommodating us! Thank you for a wonderful stay at The White Rabbit. 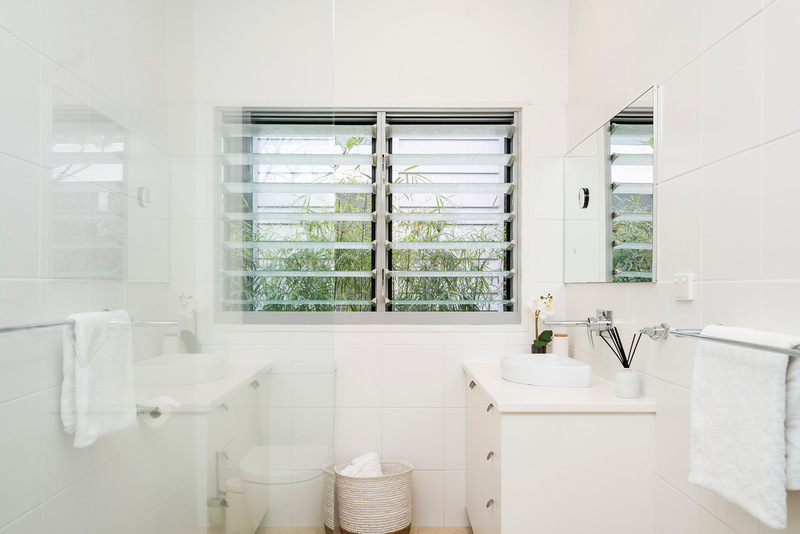 It was a luxurious, immaculately clean, tranquil home which was beautifully appointed throughout... The bedlinen, the electrical appliances, the furniture and even the bathroom products - we had a peaceful and relaxing weekend. So nice to be able to stay in such a magnificent home while we were there visiting Byron Bay for our niece's wedding. The beautiful accommodation topped off a perfect weekend for our family! Thank you for accommodating us!